Caldicellulosiruptor saccharolyticus has attracted increased interest as an industrial hydrogen (H2) producer. The aim of the present study was to develop a kinetic growth model for this extreme thermophile. The model is based on Monod kinetics supplemented with the inhibitory effects of H2 and osmotic pressure, as well as the liquid-to-gas mass transfer of H2. Mathematical expressions were developed to enable the simulation of microbial growth, substrate consumption and product formation. The model parameters were determined by fitting them to experimental data. The derived model corresponded well with experimental data from batch fermentations in which the stripping rates and substrate concentrations were varied. The model was used to simulate the inhibition of growth by H2 and solute concentrations, giving a critical dissolved H2 concentration of 2.2 mmol/L and an osmolarity of 0.27 to 29 mol/L. The inhibition by H2, being a function of the dissolved H2 concentration, was demonstrated to be mainly dependent on H2 productivity and mass transfer rate. The latter can be improved by increasing the stripping rate, thereby allowing higher H2 productivity. The experimentally determined degree of oversaturation of dissolved H2 was 12 to 34 times the equilibrium concentration and was comparable to the values given by the model. The derived model is the first mechanistically based model for fermentative H2 production and provides useful information to improve the understanding of the growth behavior of C. saccharolyticus. The model can be used to determine optimal operating conditions for H2 production regarding the substrate concentration and the stripping rate. The question of climate change, together with the increasing scarcity and cost of fossil fuels, has triggered research on the sustainable production of energy carriers, such as biofuels. Although a wide spectrum of alternative fuels and processes are available, it is still not known which of them will succeed in replacing fossil fuels in the long term. Processes for producing some biofuels, such as ethanol and methane, are already highly developed for commercial use, while others, including biohydrogen, require more basic research before they can be produced in an economically feasible way . The current major drawbacks of fermentative hydrogen (H2) production are its low yield  and the requirement of gas stripping to remove H2 from the liquid . Dark fermentation can be performed at either moderate or elevated temperatures: the productivity is generally higher in the former case , whereas the latter provides higher yields . However, for an economically sustainable biohydrogen process, high productivity should be accompanied by high yields . One solution is to focus on the process design, such as the optimization of H2 removal and substrate concentration . A higher substrate concentration is required to avoid excess amounts of water, since a surplus of process water has a negative effect on both the environmental and economic aspects of the process . It is important to find alternatives to nitrogen (N2) sparging, as this dilutes the H2, leading to a lower-grade product or the need for expensive gas upgrading to remove the N2. The extreme thermophile Caldicellulosiruptor saccharolyticus may be of industrial interest because of its ability to produce high yields of H2 from a wide variety of sugars [8, 9], ranging from pentose and hexose monomers  to complex (hemi)cellulosic materials [8, 11, 12]. However, the growth of this microorganism, as well as the production of H2 and acetic acid, is subject to substrate and product inhibition . In addition, it is sensitive to increased osmotic pressure , making it necessary to dilute the substrate. Moreover, C. saccharolyticus is inhibited by H2 , which is a general trait of H2-producing organisms. A high dissolved H2 concentration (H2aq) inhibits H2-generating hydrogenases [1, 2], leading to increased nicotinamide adenine dinucleotide, reduced/nicotinamide adenine dinucleotide (NADH/NAD) ratios, resulting in a metabolic shift toward reduced products such as lactate and ethanol [1, 3, 4] and thus decreased H2 productivity. The critical partial H2 pressure ( P H 2 ) is usually the parameter coupled to growth inhibition and lactate formation [5, 13, 15–17], although it has been shown that there are mass transfer limitations that cause the fermentation medium to be supersaturated with H2 [18, 19]. Therefore, H2aq should be considered rather than P H 2 when discussing inhibition by H2. Stripping with N2, which decreases H2aq , can significantly improve the H2 yield . Indeed, optimizing the process should consist of a compromise between minimizing the stripping gas flow rate, henceforth called the "stripping rate," and maintaining a suitable H2 yield and productivity . However, optimization must take H2 productivity into account, since it influences H2aq greatly; otherwise, the optimization will be relevant only to the specific system studied and cannot be applied to other biohydrogen systems. Furthermore, better insight into H2 productivity and liquid-to-gas mass transfer will help considerably in finding technical solutions allowing an economical and feasible fermentation process to be designed. This paper describes the development of a kinetic Monod-based model for cell growth and product formation by C. saccharolyticus, which takes the liquid-to-gas mass transfer into consideration. The derived model successfully simulates batch fermentations of C. saccharolyticus and predicts the influence of H2aq and osmotic pressure on growth as well as the metabolic shift to lactate production. To the best of our knowledge, this is the first time the inhibitory effects and liquid-to-gas mass transfer of H2 and carbon dioxide (CO2) have been included in a model for fermentative H2 production. The results obtained with the model are relevant for biohydrogen systems other than that described herein using C. saccharolyticus. C. saccharolyticus was cultivated in a N2 atmosphere in modified DSM640 medium as described previously . Cultures for inocula were grown overnight in 250-mL serum flasks containing 50 mL of modified DSM640 medium, together with a 0.4% carbon source and 0.02% cysteine. Fermentations were performed in a jacketed 3-L reactor (Applikon, Schiedam, the Netherlands) at a working volume of 1 L. The pH was monitored using an ADI 1025 Bio Console Bio Controller (Applikon) and maintained at pH 6.6 (corresponding to neutral pH at 70°C) by the addition of sodium hydroxide (NaOH). The temperature was thermostatically maintained at 70°C ± 1°C, and the stirring rate was set to 350 rpm. Prior to inoculation, the medium was reduced by the addition of 0.1% cysteine. The fermentor was continuously stripped with N2. A total of eight experiments were performed, with glucose concentrations of 5 or 10 g/L and stripping rates from 0.78 to 6 L of N2/hour, to estimate the parameters of the kinetic model. The experiments were performed on four different occasions. An overview of the experiments is given in Table 1. The H2 productivity and the cumulative H2 production were determined as described previously . aExperiments 3 and 4, as well as experiments 5 through 8, were performed using the inocula from the same preculture, respectively. The dissolved H2 concentration, H2aq, was determined in samples of cell suspensions from the bioreactor in serum flasks. The pressure in the flasks was reduced using a vacuum pump to withdraw the fermentation medium (30 to 40 mL) from the fermentor. The sealed flasks were placed in a water bath (20°C) with magnetic stirring to ensure good mixing. After one hour in the water bath, the pressure in the flasks was rapidly raised to atmospheric pressure by inserting a small needle through the cap, allowing air to enter the flasks. After 12 hours, the H2 concentration in the headspace of the serum flasks was measured as described below (Analytical methods). The volume of the collected liquid and the total volume of the individual serum flasks were measured to estimate the original H2aq in the sample. Headspace samples were analyzed for CO2 and H2 using a Varian CP-4900 Micro GC gas chromatograph (Varian, Inc., Middelburg, the Netherlands) equipped with a thermal conductivity detector (100 mA). The results were analyzed using Galaxie Chromatography Workstation version 1.9.3.2 software (Varian, Inc.). The optical density of aerobic samples was measured at 620 nm using a spectrophotometer (Hitachi U-1100; Hitachi High-Technologies Corp., Tokyo, Japan). Concentrations of acetic acid, lactic acid and ethanol were analyzed using high-pressure liquid chromatography (Waters Corp., Milford, MA, USA). An Aminex HPX-87H ion exchange column (Bio-Rad Laboratories, Hercules, CA, USA) was used at 45°C with a mobile phase of 5 mM H2SO4 at a flow rate of 0.6 mL/minute. The chromatograph was equipped with a refractive index detector (RID-6A; Shimadzu, Kyoto, Japan). The model employed in this study considers the kinetics of growth and product formation, including inhibition, liquid-to-gas mass transfer and the chemical equilibrium of CO2 and carbonates. The constants used in the model are listed in Table 2.
where G, Ac and Lac are the concentrations of glucose, acetic acid and lactic acid, respectively, and CO2sol is the concentration of bicarbonate and carbonate, resulting from the CO2 produced by the bacterium. The stoichiometric factor 2 arises from the assumption that for each mole of acid produced, one mole of NaOH is added to maintain the pH. The background osmolarity, 0.10 mol/L, resulting from yeast extract and other nutrients was calculated based on osmolarity measurements presented previously . where μ, X and rcd are the specific growth rate, the cell mass concentration and the cell death rate, respectively. Here μmax is the maximum specific growth rate, G is the glucose concentration and KG is the glucose affinity parameter. OSMcrit, H2aqcrit, n H 2 and nμ are the critical osmolarity, critical dissolved H2 concentration and the exponential parameters describing the level of inhibition, respectively. The critical parameters represent the values at which inhibition is 100%. The kinetic inhibition expressions, as presented by Han and Levenspiel , are valid only for concentrations of the inhibiting agents (OSM or H2aq) lower than the respective critical concentrations. Elevated osmolarity inhibits the growth of C. saccharolyticus , which may lead to a metabolic shift toward the production of lactic acid . Here RAcF, R L a c F H 2 and RLacFOSM are the factors relating the production rates of acetic acid and lactic acid to the growth rate; INHIB and ACT are the inhibition and activation factors, respectively (see below, Product formation) YGAc and Y G C O 2 are the stoichiometric yield coefficients of the reactions described above (equation 1); and Y G H 2 is the estimated H2 yield coefficient (mol H2/mol glucose). The following inhibition mechanisms were studied. The mass balances of the products in the liquid phase consist of an accumulation, time-dependent, and a product formation rate, concentration-dependent, term, and, when applicable, a liquid-to-gas mass transfer term. Here K l a H 2 is the overall volumetric mass transfer coefficient for H2 and H 2 a q * is the H2 saturation concentration. where K l a C O 2 is the overall volumetric mass transfer coefficient for CO2; CO2aq and C O 2 a q * are the concentration of dissolved CO2 and the saturation concentration of CO2, respectively; K1 and K2 are the dissociation constants; and CO2sol is the total concentration of carbonates. The last two expressions in the CO2 mass balance (equation 18) are related to the reaction of CO2 with water to form carbonates (see Additional file: Liquid-to-gas mass transfer and chemistry of CO2__Theory_experiments_and_results). The expressions K l a H 2 ⋅ H 2 a q - H 2 a q * and K l a C O 2 ⋅ C O 2 a q - C O 2 a q * in equations 17 and 18 describe the liquid-to-gas mass transfer of H2 and CO2, respectively (see Additional file: Liquid-to-gas mass transfer and chemistry of CO2__Theory_experiments_and_results). where YGX is the cell mass yield coefficient parameter (which is the model notation of the constant k in equation 3) and YGAc and YGLac are the stoichiometric yield coefficients (mol/mol substrate) describing the theoretical yields of cell mass, acetic acid and lactic acid, respectively. The gaseous products are produced in the liquid phase, after which they are transported to the gas phase. The mass balances of the various gaseous compounds comprise an accumulation term and a gas-to-liquid mass transfer term as well as an inflow and an outflow. Here V l and Vg are the liquid and gas volume; k l a is the volumetric mass transfer coefficient for the various compounds; H2aq and CO2aq are the dissolved concentrations of H2 and CO2; H 2 a q * and C O 2 a q * are the dissolved concentrations of the compounds at equilibrium; F i n N 2 is the flow rate of N2 into the fermentor; and F o u t N 2 , F o u t C O 2 and F o u t H 2 are the effluent flow rates of N2, CO2 and H2, respectively. Since the pH was controlled during fermentation, it was kept constant at 6.6 in the model. For more details, see Additional file 1: Liquid-to-gas mass transfer and chemistry of CO2__Theory_experiments_and_results. where k l a i0 is the volumetric mass transfer coefficient at a stripping rate of F 0 i n N 2 , k l a i is the volumetric mass transfer coefficient at a stripping rate of F i n N 2 and γ is an experimentally determined exponential coefficient. Here the diffusion coefficients for CO2 ( D C O 2 ) and H2 ( D H 2 ) are 1.98 × 10-5 and 4.65 × 10-5 cm2/second, respectively, according to Pauss et al. . Only the most important results in the estimation of the mass transfer parameters are given here; the detailed results and the methodology can be found in Additional file: Liquid-to-gas mass transfer and chemistry of CO2__Theory_experiments_and_results. To determine the kinetic parameters, fermentations were performed at two substrate concentrations and various stripping rates (Table 1). The kinetic parameters studied and estimated were YGX, Y G H 2 , μmax, RAcF, R L a c F H 2 , H2aqcrit, n H 2 , RLacFOSM, OSMcrit and nμ. Since the experiments were characterized by different growth rates as well as H2 and biomass yields, all parameters except the three related to osmolarity (RLacFOSM, OSMcrit and nμ) were estimated simultaneously for each of the 5 g/L experiments (that is, experiments 1 and 3 through 7), giving five parameter sets (Table 3). Experiments 6 and 7 were carried out under almost the same conditions with the same inocula and were thus used together to estimate one parameter set. The effect of osmolarity was assumed to be negligible in these experiments (experiments 1 and 3 through 7). The validity of this assumption was checked and is discussed below (Kinetic parameters: inhibition by osmolarity). An average of all parameters except μmax was then calculated and used to simulate all six experiments. The parameters related to osmolarity were estimated using the 10 g/L experiments (that is, experiments 2 and 8). aWe assumed that osmolarity did not have an effect at this low concentration. The validity of the assumption was checked and discussed in the Kinetic parameters: inhibition by osmolarity section of text. The value of the parameter and the 95% confidence interval (95% CI) are given for each parameter. Finally, the cell death rate (rcd; equation 5), was calculated directly from the experimental data by determining, for each experiment, the slope of the biomass curve as it declined and calculating an average value of the slope based on all experiments. The overall affinity constant (KG; equation 6) was taken from the literature on bacteria with the same type of glucose transporter system, that is, the ATP-binding cassette transport system (values are given in Table 2) [10, 27, 28]. where LSQ is the least squares quadratic, that is, the sum of the squared residuals, Yexp,i,tand Ymodel,i,t, are the experimental and model values, respectively, at time t for each compound i, that is, glucose, acetic acid, lactic acid, cell mass and H2. The parameter estimations were carried out and the 95% confidence intervals were calculated using the MATLAB functions nlinfit and nlparci, respectively (MathWorks, Natick, MA, USA). The order in which the parameters are estimated is important. Since the mass transfer influences fermentation, and thus the corresponding kinetic parameters, the mass transfer parameters were estimated prior to determining the fermentation-related kinetic parameters. where F i n N 2 is the stripping rate. For more detailed results on mass transfer, see Additional file: Liquid-to-gas mass transfer and chemistry of CO2__Theory_experiments_and_results. In fermentation experiments 1 through 7, the glucose was completely consumed and acetic acid, H2 and lactic acid were the main products (Figures 1, 2, 3, 4, 5, 6 and 7). In experiment 8, complete glucose consumption was not achieved within 40 hours (Figure 8). Experimental and model results for experiment 1. Experimental results: (A) Liquid concentrations: Glucose (asterisks), acetic acid (open squares), cell mass (open circles), lactic acid (open diamonds). (B) Accumulated hydrogen (H2) production (open circles). Model results: Average values were used for all parameters except μmax. (A) Liquid concentrations: Glucose (solid lines), acetic acid (dashed-dotted lines), cell mass (dotted lines), lactic acid (dashed lines). (B) Accumulated H2 production (straight lines). Experimental and model results for experiment 3. Experimental results: (A) Liquid concentrations: Glucose (asterisks), acetic acid (open squares), cell mass (open circles), lactic acid (open diamonds). (B) Accumulated H2 production (open circles). Model results: Average values were used for all parameters except μmax. (A) Liquid concentrations: Glucose (solid lines), acetic acid (dashed-dotted lines), cell mass (dotted lines), lactic acid (dashed lines). (B) Accumulated H2 production (straight lines). Experimental and model results for experiment 4. Experimental results: (A) Liquid concentrations: Glucose (asterisks), acetic acid (open squares), cell mass (open circles), lactic acid (open diamonds). (B) Accumulated H2 production (open circles). Model results: Average values were used for all parameters except μmax. (A) Liquid concentrations: Glucose (solid lines), acetic acid (dashed-dotted lines), cell mass (dotted lines), lactic acid (dashed lines). (B) Accumulated H2 production (straight lines). Experimental and model results for experiment 5. Experimental results: (A) Liquid concentrations: Glucose (asterisks), acetic acid (open squares), cell mass (open circles), lactic acid (open diamonds). (B) Accumulated H2 production (open circles). Model results: Average values were used for all parameters except μmax. (A) Liquid concentrations: Glucose (solid lines), acetic acid (dashed-dotted lines), cell mass (dotted lines), lactic acid (dashed lines). (B) Accumulated H2 production (straight lines). Experimental and model results for experiment 6. Experimental results: (A) Liquid concentrations: Glucose (asterisks), acetic acid (open squares), cell mass (open circles), lactic acid (open diamonds). (B) Accumulated H2 production (open circles). Model results: Average values were used for all parameters except μmax. (A) Liquid concentrations: Glucose (solid lines), acetic acid (dashed-dotted lines), cell mass (dotted lines), lactic acid (dashed lines). (B) Accumulated H2 production (straight lines). Experimental and model results for experiment 7. Experimental results: (A) Liquid concentrations: Glucose (asterisks), acetic acid (open squares), cell mass (open circles), lactic acid (open diamonds). (B) Accumulated H2 production (open circles). Model results: Average values were used for all parameters except μmax. (A) Liquid concentrations: Glucose (solid lines), acetic acid (dashed-dotted lines), cell mass (dotted lines), lactic acid (dashed lines). (B) Accumulated H2 production (straight lines). Experimental and model results for experiment 2. Experimental results: (A) Liquid concentrations: Glucose (asterisks), acetic acid (open squares), cell mass (open circles), lactic acid (open diamonds). (B) Accumulated H2 production (open circles). Model results: Average values were used for all parameters except μmax. For μmax, a value of 0.25/hour was used. (A) Liquid concentrations: Glucose (solid lines), acetic acid (dashed-dotted lines), cell mass (dotted lines), lactic acid (dashed lines). (B) Accumulated H2 production (straight lines). Experimental and model results for experiment 8. Experimental results: (A) Liquid concentrations: Glucose (asterisks), acetic acid (open squares), cell mass (open circles), lactic acid (open diamonds). (B) Accumulated H2 production (open circles). Model results: Average values were used for all parameters except μmax. For μmax, the average growth rate of experiment 5 through 7 was used (0.22/hour). (A) Liquid concentrations: Glucose (solid lines), acetic acid (dashed-dotted lines), cell mass (dotted lines), lactic acid (dashed lines). (B) Accumulated H2 production (straight lines). The six 5 g/L experiments (that is, experiments 1 and 3 through 7) differed with respect to growth rate and H2 yield (Figures 1, 2, 3, 4, 5 and 6). The reason for the variations is not clear. However, the two sets of experiments, carried out in parallel using inocula from the same preculture (experiments 3 and 4 as well as experiments 5 through 8), showed a strong resemblance. Batch experiments are generally characterized by poor reproducibility, as has also been observed with Escherichia coli . Owing to the variations between the experiments, each of the 5 g/L experiments was used separately to estimate all parameters except OSMcrit, nμ and RLacFOSM, which were estimated using the 10 g/L experiments (experiments 2 and 8 and Figures 7 and 8). In addition, acetic acid and H2 were not produced at a stoichiometric ratio (1:2) in any of the experiments, which is in agreement with prior observations in continuous culture [15, 21] where the H2/acetic acid ratio depended on the dilution rate. Instead, less acetate was produced in relation to H2, and the H2 yield was thus considered a parameter in the model. A possible explanation of the nonstoichiometric yield is that acetic acid is used as a building block by the cells. The estimated maximum growth rate of C. saccharolyticus varied between the different experiments; however, the values were similar for experiments carried out in parallel (that is, experiments 3 and 4 and 5 through 8) (Table 3). The μmax determined for glucose ranged from 0.21 to 0.36/hour and corresponded well with earlier findings, which varied from 0.2 to 0.5/hour [14, 21]. Vrije et al. found different values of μmax obtained in washout experiments with C. saccharolyticus, depending on the growth history of the culture. The reason for the variation in growth rates has not yet been elucidated, but the quality of the inocula used seems to depend on its growth history. The variation in growth rate was considered in the present model by not using an average value of μmax, while average values were used for all the other parameters (described in more detail below, Kinteic parameters: inhibition by dissolved hydrogen). Together with changes in the product yields, the variations in growth rates strongly suggest that an as yet unknown factor influences the metabolism. Also, it is likely that the highest value of μmax determined in this study (0.36/hour) is not the true maximum, that is to say, the real μmax that can be achieved for glucose by this organism. This could mean that the growth of C. saccharolyticus is normally suppressed, as has been observed for E. coli . The cause of the suppression of the growth of C. saccharolyticus is not understood and must be further studied to gain a better understanding of the physiology of the microorganism and to improve the model . As described above (Growth and product kinetics in C. saccharolyticus), the effects of two environmental conditions, that is to say, H2aq and osmolarity, on the growth, the production of acetic acid and H2, and the activation of lactic acid production of C. saccharolyticus were studied. All parameters except and RLacFOSM, OSMcrit and nμ were estimated for each of the experiments with 5 g/L glucose (Table 3), from which their average values were calculated (Table 4). The experimental results are presented in Figures 1, 2, 3, 4, 5, and 6, together with the predictions of the model using the average values of the parameters (except for μmax). The average value of μmax was not used because of the large variation in this parameter; instead, the average within each set of parallel experiments was used. The model then agreed well with the experimental results and also reflected the effect of H2aq on the microorganism. Interestingly, the parameter n H 2 has quite a high value (4.5), which indicates a steplike response to the inhibiting agent, H2; that is, at lower concentrations, the inhibition increases only a little with the concentration, whereas at higher concentrations the inhibition increases dramatically with increased concentration. The value of the H2 yield coefficient parameter, Y G H 2 , ranged from 3.7 to 6.2 mol H2/mol glucose. The upper value exceeds the Thauer limit, which is 4 mol H2/mol glucose . However, the observed H2 yield obtained in the simulations and in the experiments never exceeded the Thauer limit; that is, the molar ratio of H2 produced to glucose consumed is always below 4. The high values of Y G H 2 are an effect of the nonstoichiometric ratio between H2 and acetic acid seen during the experiments, described as Y G H 2 ∕ Y G A c in the model (equation 10). The ratios are often above 2 mol H2/mol acetic acid and, in the model, this comes out as a higher H2 yield coefficient parameter. The reason for the H2 and acetic acid ratio not being equal to 2, as the stoichiometry of reaction 1 shows, might be that some of the acetic acid produced is taken up and utilized by the cell. aThe values given are based on experiments 1, 3, 4, 5, 6 and 7. Supersaturation of dissolved H2 occurred during fermentation, as measured experimentally and predicted by the model (Table 5), as reported previously [18, 19]. Oversaturation ranged from 4.9 to 52 times the saturation concentration, which corresponds well with the results of other studies [18, 19]. The large deviation in the measured values of H2aq (Table 5) is an effect of the large uncertainties in the measurements. The oversaturation of H2aq can also be clearly seen in Figure 9, where values of H2aq calculated with the model for a few experiments are shown together with the saturation concentration of H2 for experiment 6.
aHydrogen (H2) concentration, H2 productivity and H2aq are the experimentally determined H2 concentration in the gas phase, H2 productivity and dissolved H2 concentration, respectively. H2aq at equilibrium is the corresponding theoretical H2aq at equilibrium with the gas. Oversaturation is the experimentally determined degree of H2 oversaturation in the liquid. H2aq (model) is the dissolved H2 concentration calculated by the model under the same conditions. Dissolved hydrogen concentration as a function of fermentation time. The dissolved H2 concentration predicted by the model as a function of fermentation time for experiments 3, 4, 5 and 6 is shown. Note the rapid increase in dissolved H2 concentration in experiment 4, which is the effect of the low stripping rate and high growth rate. The predicted equilibrium dissolved H2 concentration (based on the partial pressure of H2) is also included for experiment 6. The experiment with the lowest stripping rate (experiment 4) showed the highest production of lactic acid (Figure 3). The other two experiments with low stripping rates (experiments 6 and 7) (Figures 5 and 6) showed only a slight increase in lactic acid production compared to the experiments with high stripping rates (experiments 1, 3 and 5) (Figures 1, 2 and 4) and very little lactic acid production compared to experiment 4. This can be explained by the lower growth rates resulting in lower H2 productivity, and hence lower values of H2aq, in experiments 5 through 7 (Figures 4, 5 and 6). Experiments 3 and 4 both showed high initial growth rates characterized by a high value of μmax and hence high H2 productivity, leading to higher values of H2aq. 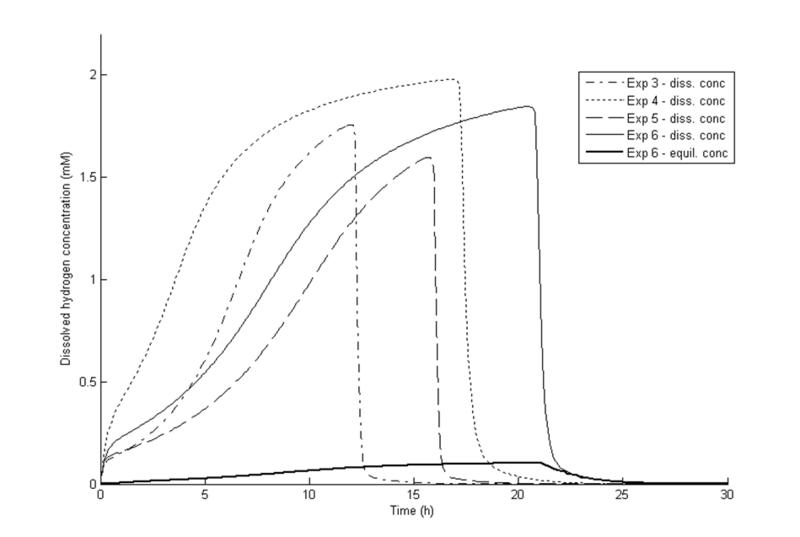 In experiment 4, with a low stripping rate (0.78 L/hour), H2aq reached a plateau faster than it did in the other experiments (Figure 9). At that stage, the culture reached maximum H2 productivity (data not shown), which resulted in linear rates of glucose consumption and H2 and acetic acid production (Figure 4). This behavior was reflected by the model (Figure 4) and can be explained by growth inhibition by H2. When H2 productivity reaches a critical value in the fermentation system, the cells respond with a reduction in the specific growth rate, and hence a plateau is observed. This plateau was reached much faster in experiment 4 than in the other two low-stripping-rate experiments (experiments 6 and 7), which was due to a combination of the higher initial growth rate and H2 productivity and the lower stripping rate (Table 1). The model with estimated parameters for inhibition by H2aq can be used to indicate how H2 productivity, P H 2 , H2aq and the overall mass transfer coefficient are related (Figure 10). The dissolved H2 concentration in experiment 4 reached almost 80% of the value of H2aqcrit (indicated by the red line in Figure 10) after 10 hours, and, Dissolved hydrogen: degree of supersaturation and its effect), H2 productivity and hence H2aq were constant until glucose was depleted (Figures 3 and 9). The dissolved H2 concentration in experiment 5, on the other hand, was always well above the red line in Figure 10 and also showed little lactic acid production. In experiments 6 and 7, H2aq also ended up near the red line (Figure 10); however, both reached it much later (at 17 hours; that is, only 4 hours before the glucose was depleted). This was due to lower growth rates and slightly higher stripping rates. Finally, H2aq in experiment 1 crossed the red line after 16 hours with little production of lactic acid, which may be due to an exponential increase in H2 productivity, and the line was crossed when very little glucose remained; hence almost no substrate was left for lactic acid production (Figure 1). State of severe hydrogen inhibition as a function of hydrogen productivity, P H 2 and k l a H 2 . The straight lines show the combinations of H2 productivity, P H 2 and K l a H 2 , resulting in a state of severe H2 inhibition. The state of severe H2 inhibition is assumed to occur at a value of H2aq equal to 80% of H2aqcrit (corresponding to a reduction in the growth and H2 production rate of 37%). The further away from, and above, the lines the state of a fermentation experiment is, the lower the inhibition by H2. An increase in H2 productivity and a decrease in K l a H 2 move the state of the fermentation to the right and down, respectively, on the graph, while an increase in P H 2 increases the slope of the lines. These changes all increase the dissolved H2 concentration and move the state of a fermentation experiment closer to a state of H2 inhibition. The open squares show the state of each experiment at the time of maximum productivity. An additional point is included for experiment 1 (12 hours), showing the state four hours before maximum productivity occurred. The curved line shows the relation between the stripping rate and K l a H 2 (the relation given by equation 27). The experimental K l a H 2 values (calculated from experimental values of K l a C O 2 using equation 25) are also included (open circles). The organism thus seems to respond to an increase in H2aq by adjusting its growth rate and directing its metabolism toward the production of lactate, thus fine-tuning H2 productivity to prevent H2aq values detrimental to the cell. On the basis of both the experimental data and the model, it is clear that dissolved H2 has a negative effect on C. saccharolyticus and that H2 productivity and the stripping rate have a considerable impact on H2aq. This can explain why fermentation with high H2 productivity commonly results in low H2 yields [15, 21, 32, 33] and why an increase in the stripping rate tends to increase H2 yield and productivity . The dissolved H2 concentration can be lowered by stripping with N2 gas (Figure 11), which also results in higher H2 yields [19, 34–36]. Kraemer and Bagley  published details of a study in which they optimized the stripping rate with respect to H2 yield and productivity. They concluded that a stripping rate of 12 mL/minute, resulting in a volumetric mass transfer rate of 5/hour, was optimal. However, this was only valid for their particular system and not for systems with higher H2 productivity and different liquid-to-gas mass transfer properties. Figure 11 shows H2aq calculated by our model at various stripping rates and H2 productivities for the reactor system used herein. It is evident that H2aq is a function of both variables. H 2aq as a function of the stripping rate and hydrogen productivity. 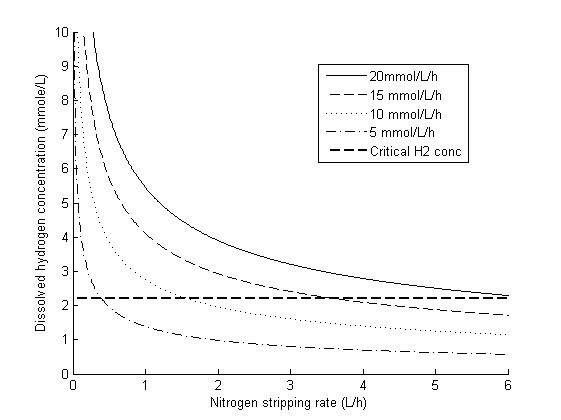 The horizontal line shows the estimated critical H2 concentration. Furthermore, the current model cannot simulate a system without sparging, since k l a is based on the stripping rate (equation 24). However, Figure 10 provides an excellent basis for further discussions, since the relation between K l a H 2 , P H 2 and H2 productivity still holds, even without stripping. For instance, with C. saccharolyticus at a total pressure of 1 atm, no stripping, a productivity of 10 mmol H2/L/hour, and a gas composition of 60% H2 and 40% CO2, a value of K l a H 2 of at least 7.5/hour is required to avoid serious H2 inhibition (Figure 10). Experiments 2 and 8 were carried out with almost identical initial conditions, but they progressed quite differently, probably due mainly to different inocula and a slight difference in the initial glucose concentration. It was evident that H2aq as the sole inhibitor could not adequately describe the system at elevated substrate concentrations (Figures 7 and 8). Indeed, the model fitted the data from experiments 2 and 8 very well after introducing growth inhibition by osmotic pressure. The average value of μmax in experiments 5 through 7, which were carried out using the same inocula as experiment 8, was used for experiment 8. However, since no experiments were carried out using the same inocula as experiment 2, together with a low glucose concentration, the value of μmax for experiment 2 is not known. Instead, the average value of μmax for the three sets of 5 g/L experiments (experiment 1, experiments 3 and 4, and experiments 5 through 7) was assumed (0.27/hour) when estimating the inhibition parameters for osmolarity, that is, RLacFOSM, OSMcrit and nμ (Table 6). Applying this extended model to the experiments with lower glucose concentrations confirmed that the osmolarity had a minor influence on the outcomes of the fermentations under those conditions. To estimate the three parameters describing the inhibition by osmolarity, μmax for experiment 2 had to be assumed. This assumption mainly affects the value of the exponential factor, nμ, and not RLacFOSM or OSMcrit (Table 5). This strongly indicates that OSMcrit for C. saccharolyticus is in the range of 0.27 to 0.29 mol/L, a range that is in agreement with previous results of a study by Willquist et al. .
aData are values of the parameter with the confidence interval (CI, 95%) are given for each parameter. Although this rather simple model describes the effect of osmolarity well, some aspects of it cannot be reproduced by this type of unstructured, mechanistic model. It is evident from Figure 8 that the growth rate, and hence the glucose consumption and acetic acid production rates, are not affected at the initiation of growth, since the model excluding inhibition by osmolarity fits the first three points perfectly. However, at an osmolarity of about 0.2 mol/L, there is a shift toward a reduction in the growth rate, glucose consumption, and acetic acid production rate, as well as an increase in lactic acid production, rapidly at first, followed by a slow decline of all of them. It is not possible to model this effect, that is, a rapid shift followed by a slow gradual decrease, using a simple inhibition expression. One could assume a very high exponential factor, but that would predict only the beginning of the experiment; however, as inhibition came into effect, the decrease in the growth rate to zero would not be slow and gradual, but very considerable and rapid. Batch fermentations of C. saccharolyticus on glucose were successfully simulated using Monod kinetics extended to include liquid-to-gas mass transfer and inhibition by H2aq and osmolarity. In agreement with previous measurements [18, 19], the model predicted high oversaturation of H2 in the liquid, which was also confirmed experimentally. To the best of our knowledge, we have demonstrated for the first time the possibility of predicting H2aq and its effect on the fermentation in a laboratory-scale bioreactor as a function of stripping rate and productivity using the derived model. With this tool, it was possible to conclude that the inhibition of growth and H2 production depend on both H2aq and osmolarity. 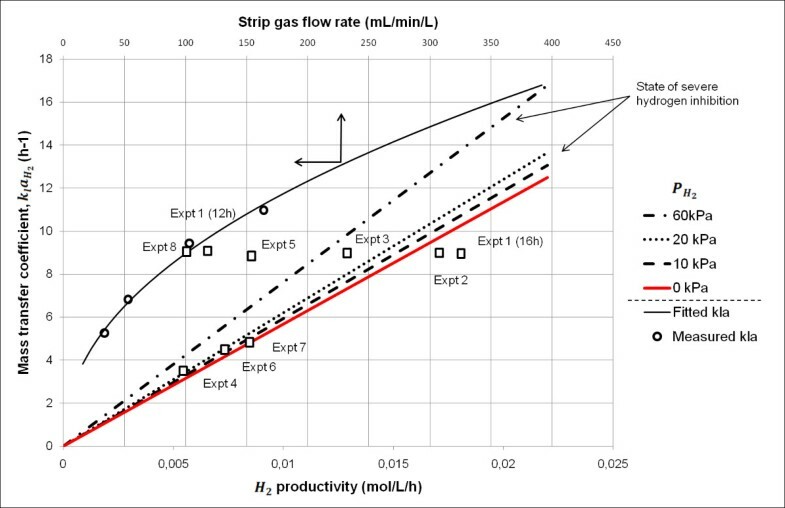 The model described the inhibition by both H2aq and osmolarity satisfactorily and can hence be used to predict the optimal stripping rate and substrate concentration. It also shows how C. saccharolyticus responds to increased osmolarity and H2aq. In addition, the modeled relationship between mass transfer, H2 productivity and H2aq is not specific to C. saccharolyticus, but can also be applied to other systems. To widen the applicability of the model even further, future studies should aim at incorporating the effect of the stirrer speed and the absence of stripping on the liquid-to-gas mass transfer. Ac: acetic acid concentration (mol/L); CO2aq: CO2 concentration in the liquid phase (mol/L); C O 2 a q * : saturation concentration (mol/L); CO2sol: solubilized CO2 (mol/L); F o u t C O 2 : flow rate of CO2 out of the fermentor (L/hour); F o u t H 2 : flow rate of H2 out of the fermentor (L/hour); F i n N 2 : flow rate of N2 into the fermentor (L/hour); F o u t N 2 : flow rate of N2 out of the fermentor (L/hour); G: substrate concentration (mol/L); H2aq: H2 concentration in the liquid phase (mol/L); H2aqcrit: critical H2 concentration in the liquid phase (mol/L); H 2 a q * : saturation concentration (mol/L); H H 2 : Henry's constant for H2 (L atm/mol); H C O 2 : Henry's constant for CO2 (L atm/mol); K1: dissociation constant for CO2 into bicarbonate; K2: dissociation constant for bicarbonate into carbonate; K l a H 2 : mass transfer coefficient for H2 (per hour); K l a C O 2 : mass transfer coefficient for CO2 (per hour); KG: saturation constant (mol/L); Lac: lactic acid concentration (mol/L); nμ: inhibition coefficient for inhibition by osmolarity; n H 2 : inhibition coefficient for inhibition by H2; OSM: osmolarity parameter (mol/L); OSMcrit: critical osmolarity parameter (mol/L); P H 2 : partial pressure of H2 (Pa); p H 2 c r i t : critical partial pressure of H2 (Pa); Ptot: total pressure (Pa); PPi: pyrophosphate; LSQ: least squares quadratic; R: gas constant (L atm/K/mol); RAcF: maximum Ac production rate (mol/g cell mass/hour); R L a c F H 2 : maximum Lac production rate caused by H2 (mol/g cell mass/hour); RLacFOSM: maximum Lac production rate caused by osmotic pressure (mol/g cell mass/hour); rcd: death rate of cells (per hour); T: temperature (Kelvin); Vg: gas volume in liquid (L); Vl: liquid volume in reactor (L); X: cell mass concentration (mol/L); YGAc: stoichiometric acetic acid yield (mol acetic acid/mol substrate); Y G C O 2 : stoichiometric CO2 yield (mol CO2/mol substrate); Y G H 2 : stoichiometric H2 yield (mol H2/mol substrate); YGLac: stoichiometric lactic acid yield (mol lactic acid/mol substrate); YGX: biomass yield (mol cell mass/mol substrate); α: cell-growth-associated constant; αAc: cell-growth-associated constant for Ac production rate (mol Ac/mol cells); α C O 2 : cell growth-associated constant for CO2 production rate (mol CO2/mol cells); α H 2 : cell growth-associated constant for H2 production rate (mol H2/mol cells); αLac: cell-growth-associated constant for Lac production rate (mol Lac/mol cells); β: non-cell-growth-associated constant; γ: exponential coefficient for mass transfer correlation; μ: specific growth rate (per hour); μmax: maximum specific growth rate (per hour). The authors gratefully acknowledge the Commission of the European Communities, Sixth Framework Programme, Priority 6, Sustainable Energy Systems (019825 HYVOLUTION), as well as the Swedish Energy Agency for their financial support. ML developed the model, carried out the parameter estimations and planned as well as performed the mass transfer experiments. ML also wrote the main part of the manuscript and took part in the planning and execution of the fermentation experiments. KW took part in the development of the model, planned and carried out the main part of the fermentation experiments, analyzed the results and assisted in the mass transfer experiments. KW also wrote parts of the manuscript. GZ and EVN participated in the coordination of the study and reviewed the manuscript. All authors read and approved the final manuscript.